Spring is coming to the Northern Hemisphere! 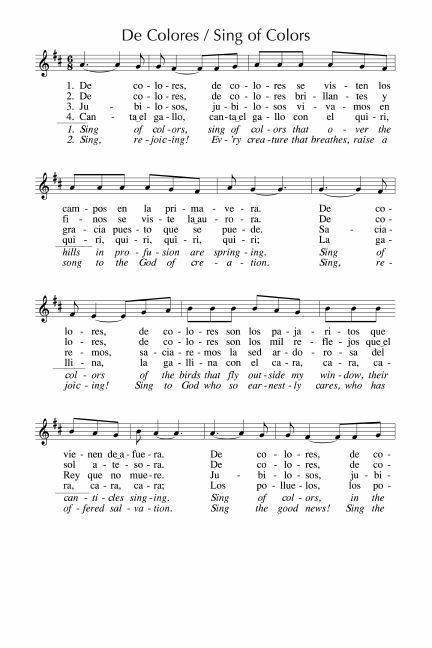 NCH34 / Iona (SL) / CH138 / SgTJ1065 Nourished by the rainfall the earth can come alive / Flowers of every colour now raise their heads in pride / As the rain is falling / Alabanza (Pablo Fernández-Badillo) Complex words, but a simple repetitive tune. Inclusive, earthy. Great for a temperate Springtime. There are quite a few different English translations of this Puerto Rican song. I particularly like the translation in Church Hymnary / Hymns of Glory Songs of Praise. midi sample. VU632 / StS100 / WoV695 / ELW447 / SFFS 2076 / StF617 O blessed Spring where word and sign (Susan Palo Cherwien) Imagery of Christ the vine and the changes that the seasons bring, this song speaks of all four seasons. Hymnals vary in the tune selected. I like it best to O WALY WALY. Lyrics. FFS59 Spirit of springtime in creation's garden (Shirley Murray) Good tune and words, and very Antipodean. "Beauty will break through rotted leaves and ashes, joy will erupt and life will leap free!". Lyrics. *NCH005 / VU243 Praise to God praise to God for the greenness (Nobuaki Hanaoka) Earth's beauty; sung to a simple Japanese tune (SAKURA). A good hymn for kids who can read. Good for kids. NCH402 Sing of colours (De Colores) I love this traditional Mexican song. Not too hard in Spanish, really easy and catchy in English. Partial lyrics and sheet music. Lyrics and midi. Slightly silly version on youtube. NCH433 / CH727 / UMH707 / VU703 / HPP474 / GtG250 / W&R515 / Cha638 In the bulb there is a flower (Natalie Sleeth) A simple song of hope symbolised in nature. Lyrics. FFS51 O spring in the desert (David Adam) Christ's presence in water and light; Christ as guide. Excellent imagery, good tune. Lyrics. CH224 / VU187 / AA140 The spring has come (Shirley Murray) Joyful tune and words. Fun rhythms. Lyrics & sheet music sample. UMH508 / VU644 / Cha535 Faith while trees are still in blossom (Anders Frostenson) Excellent words of faith when things seem a bit hopeless. Sings of Noah and Moses. Lyrics. STB288 May the Lord bless you with joy / Mar ba zey (Burma / Karen Blessing) A blessing from the Karen people of Burma. Would not be too hard to sing in Karen, but there is also a lovely English translation. Would be particularly nice in Spring time when the flowers are all in bloom. Online Resource / Tune In Making things new (Sheree Anderson). A groovy one. Great for kids, and lots of fun. Free downloadable sheet music, reference recording. Good for kids. Unknown Source We'll weave a love / Song of Community (Carolyn McDade) A song of all seasons. It's a little bit tricky to learn, but once learned, you will not forget it "We'll weave a love that greens sure as spring, then deepens in summer to the fall autumn brings". Lyrics. Online Resource Flow'ring in the summer / Faithful Seasons (Helen Wiltshire) Australian imagery for all the seasons, and how it's worth celebrating them! Free book download. CH141 / A&M548 / SP250 / URW077 / StF114 Oh the life of the world is a joy and a treasure (Kathy Galloway) Good inclusive words about God's presence in "the life of the world" (nature, seasons, childbirth, justice). The tune is a simple Celtic-style melody.